With seven Academy Award nominations including Best Picture under its belt, a movie like Babel must have struck a right cord somewhere. The impressive cast line-up includes Brad Pitt and Cate Blanchett, as well as remarkable newcomers whose performances are so grippingly good that their acting made a mark as much as the rawness of their appearance on screen. Amongst these, Rinko Kikuchi put up a sterling performance as a deaf-mute girl caught in the world of her own pent-up and complicated emotions. Kikuchi, who was not deaf in real life, was a Golden Globe and Oscar nominee. Another supporting actor, Adriana Barraza, was also a Golden Globe award nominee. She played the role of a Mexican nanny who was left to deal with the vulnerable hearts of children in the dysfunctional family of a strained marriage. 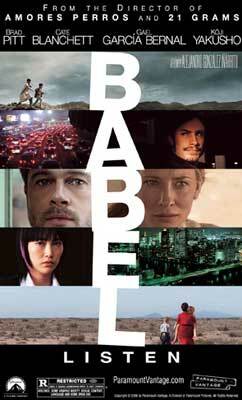 Babel is a movie about communication breakdown as much as the intricacies of relationships and human ties. The title ‘Babel’ was taken from the biblical story about men who wanted to build a tower that reach up to heaven and this angered God who made the men speak different languages and quarrelled amongst themselves. Thus, their project was never accomplished. Babel weaves together stories of individual from different backgrounds and cultures who are caught in relationships that require them to draw from the deep recesses of their emotional strength. It deals sensitively and honestly with the nuances and complexity of emotions that underlie such relationships. Babel is an intense movie that requires you to sit through a probing experience that may well change your perspective of life. It is a film about domestic life and relationships that has truly earned its international acclaim. This entry was posted on Friday, February 9th, 2007 at 9:05 am	and is filed under Movie Trailer. You can leave a response, or trackback from your own site.